Across our planet, there are a plethora of remarkable creatures that captivate our imaginations. There are rare birds of paradise in New Guinea and Indonesia, whose colorful feathers and intricate courtship displays are absolutely astounding. Then there are whales, the graceful behemoths of the sea, whose songs for each other propagate far through the open ocean. Then there’s the male proboscis monkey, who looks like he has a (very well endowed) male genitalia hanging from its face—wait, what? As it turns out, there are also some very peculiar creatures on Earth. Unfortunately, some of these astounding (but unfortunate looking) creatures do not get the attention they need because of their looks, names, or behavioral habits. It’s great that we have such large movements to save the pandas, and that we ban whale hunting (all things that I am a staunch defender of), but the ugliest animals on the planet need conservation efforts too. Yet, they don’t receive the attention they deserve because of our particular bias. Which is why this article is on the ugliest animal in the world, as well as the group that set out to get people to vote for its rather cruel name…all in an effort to raise awareness. Without Further Ado, Meet the Blobfish. It brings me great pleasure to introduce to you the ugliest creature in the world: Psychroslutes marcidus, better known as the blobfish. It has a face that (as the saying goes) only its mother could love. Not much is known about these deep-sea dwellers. This gelatinous ball of mass is hard to even identify as a living organism (at least in relation to anything else that we are used to seeing on this planet). The deep ocean abyss harbors many exotic creatures, and this one tends to frequent the deep, cold waters off Tasmania, Australia, and New Zealand. Usually, they are under 30 cm, which makes them rarely bigger than a ruler. What’s more, the blobfish’s density is slightly less than water. This allows the fish to hover over the ocean floor, which makes it remarkably efficient at saving energy (a prerequisite for most deep-sea creatures, as food is rather scarce). Blobfish are almost completely lacking in muscle and bone, as muscle is dense and heavy, and the creature would be crushed under the immense pressures of the deep ocean. So how does this strange animal eat without muscle to propel it about? Well, when you live at a staggering 600 to 1200 meters (2000 to 3900 feet), all you can really do is drift around with your mouth open, which it happily does. The blobfishdoes not hunt, but patiently waits for a chance to gobble up small chunks of edible matter that fall from the surface above. This creature got the prestigious title of “Ugliest Animal on the Planet” by a panel called the Ugly Animal Prevention Society (UAPS). The entirety of their mission is to label endangered creatures like this in order to get them attention, the kind of attention usually devoted to cute animals like pandas. The UAPS provided a large list of ugly animals for people to choose from, and this creature was ultimately the one chosen. We’ve needed an ugly face for endangered animals for a long time, and I’ve been amazed by the public’s reaction. For too long the cute and fluffy animals have taken the limelight, but now the blobfish will be a voice for the mingers who always get forgotten. Researchers state that extinction rates are increasing exponentially. And the ugliest of the bunch need even more help due to lack of human empathy. So share this story. Spread the word with friends—Ugly animals need our assistance too. 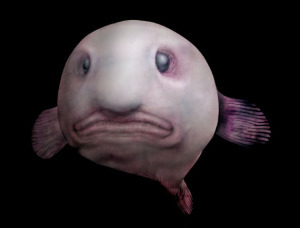 *Note: The blobfish would not seem quite so ugly if you met it on its own turf. Think of it this way—if you were to travel to a depth of 4,000 feet, you would turn into a squished mass of human paste. 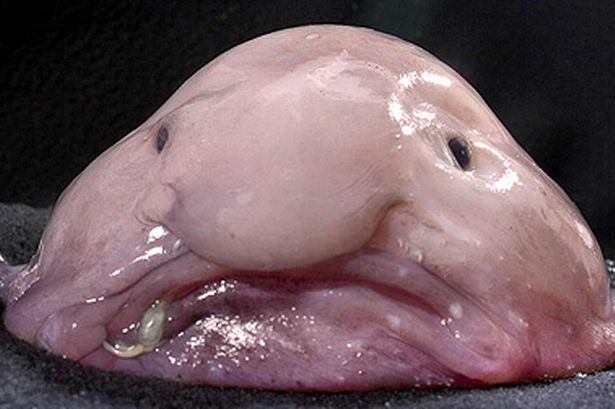 However, at this depth, the blobfish would just look like, well, pretty much any other fish you’ve ever seen.